As I didn´t find too much info on its inner workings, I present a little teardown of the M8 by Wild Heerbrugg - a "workhorse stereo microscope" of the mid 1970s. By today´s standards, the design is plain functional and less futuristic than the current stereos from the "big four" (i.e. Leica, Nikon, Olympus and Zeiss). 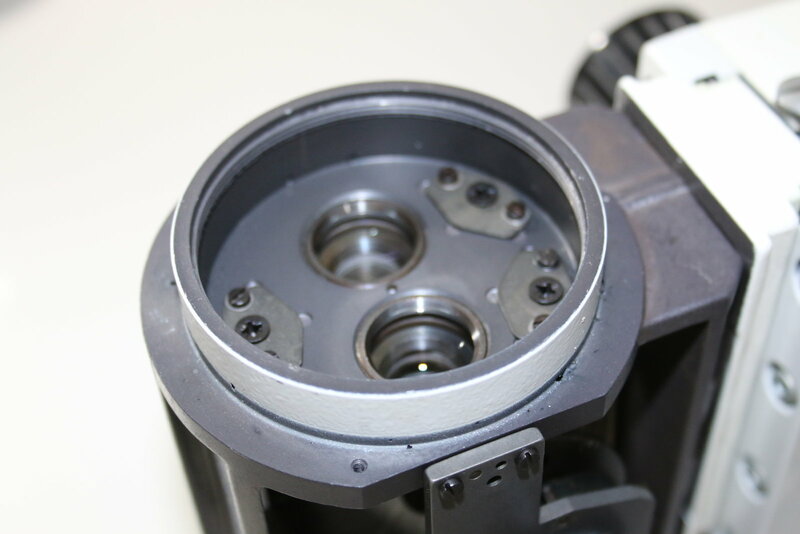 But the M8 is very robust (you will not find much plastic in it) and features a modular construction that allows for fast and easy repair as well as extensibility (Interested? Go here: M8´s optional extensions). 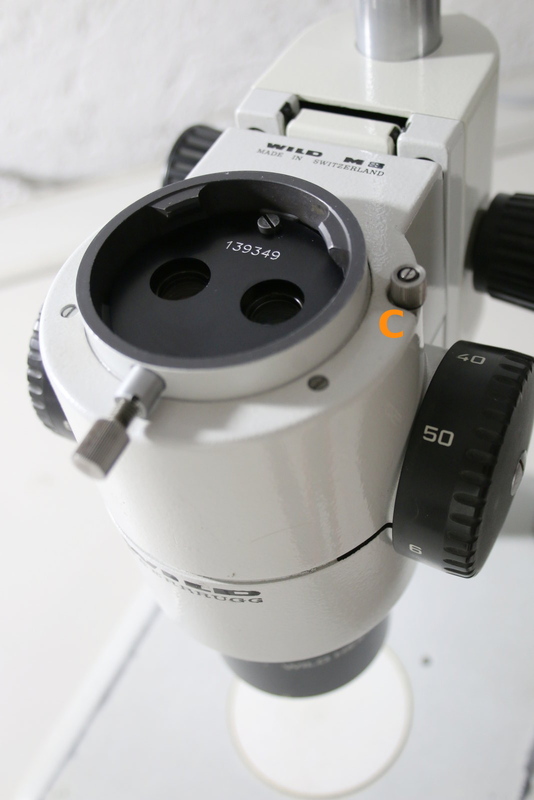 The binocular head (2) with the eyepieces (1) can be unscrewed (A) and taken off the microscope body (3). Regarding the eyepieces and their maximum field number: The default eyepieces were Wild 10x/21. I have tested the M8 with eyepieces of significantly wider fields of view (fov), i.e. with the Olympus WSH10x/22, the Olympus GWH10x/23 and even with the superb ultra-widefield Olympus SWH10x/26,5. All of them worked perfectly as long as they were not combined with the optional coaxial illuminator (Wild part number 327616) or a phototube (Wild part number 180570 in my case, the 50/50 version with 3d stereo and camera picture simultaneously - I did not test it with the part number 404891 phototube and also not with the Leica/Wild ergotube !). The latter two limited the usable fov to a field number of 22. Parfocality, i.e. a sharp picture while zooming without the need to re-focus, was not a problem with any of the eyepieces. 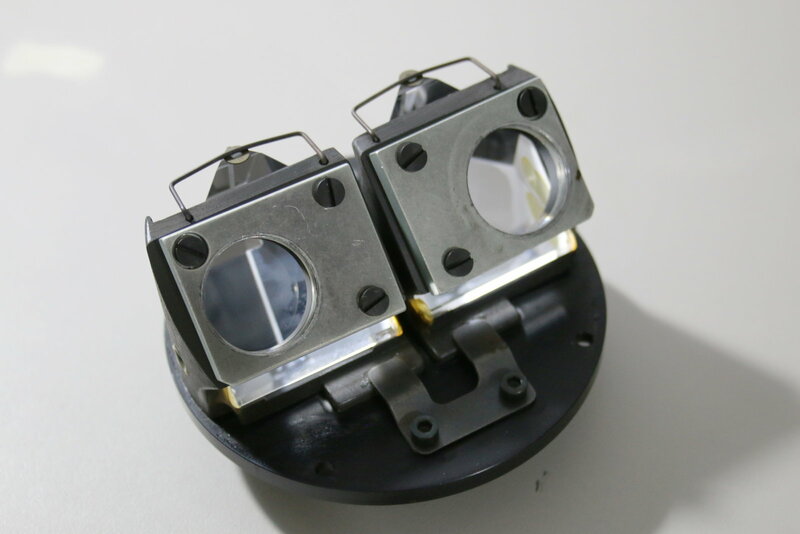 The two eyepiece tubes can be unscrewed to get to the prisms inside the head. The prism surface is well visible and clean in my case. 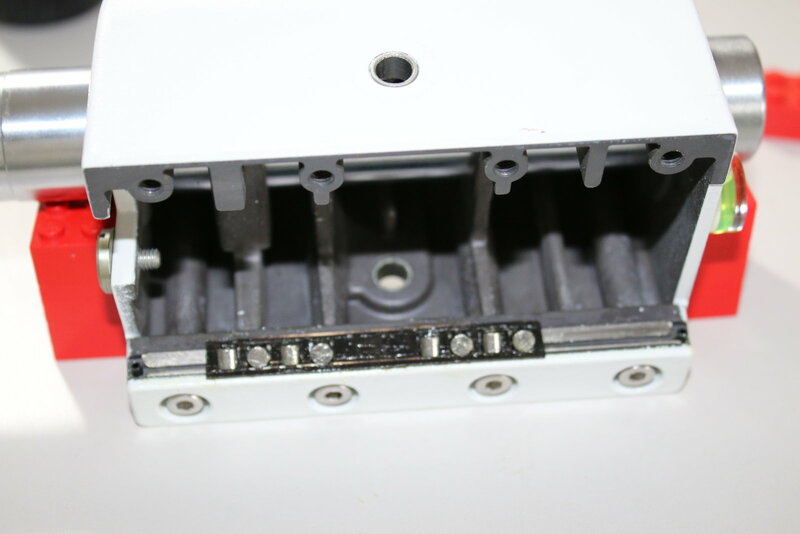 Attention to the DIYers out there: The prisms mustn´t be removed from their clamps unless they are out of alignment. 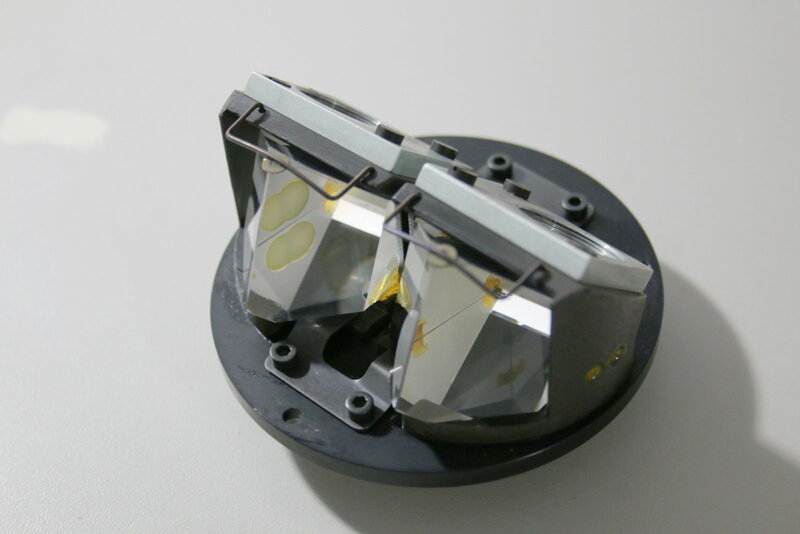 And another hint: The prism holders slide on a thin film of grease for fast adjustment of the interpupillary distance (don´t contaminate the prisms with it!). If the adjustment seems to require too much force, relubrication might prove helpful. 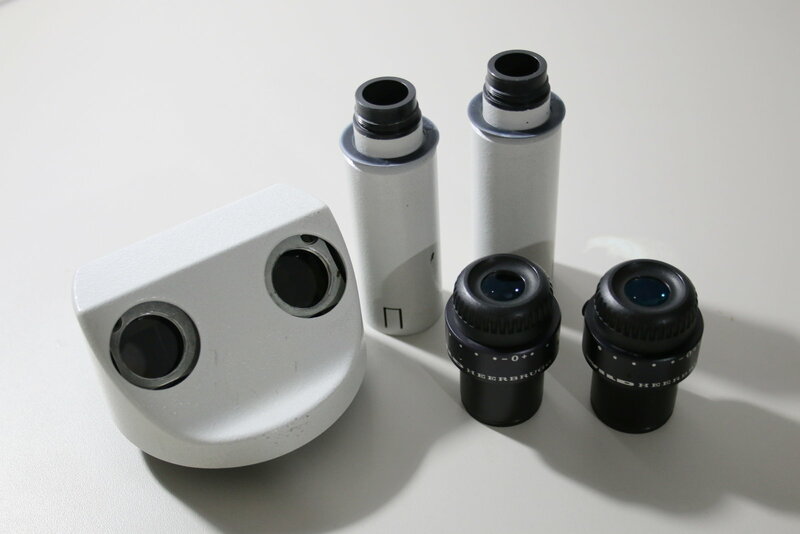 The Wild part number 139349 is the M8 microscope´s body that provides 6 to 50 fold magnification (as long as 10x eyepieces are used...) and a 8.3 zoom ratio respectively. The setting screw "C" adds "clicks" to the zoom action - a useful option for additional haptic and acoustic feedback. 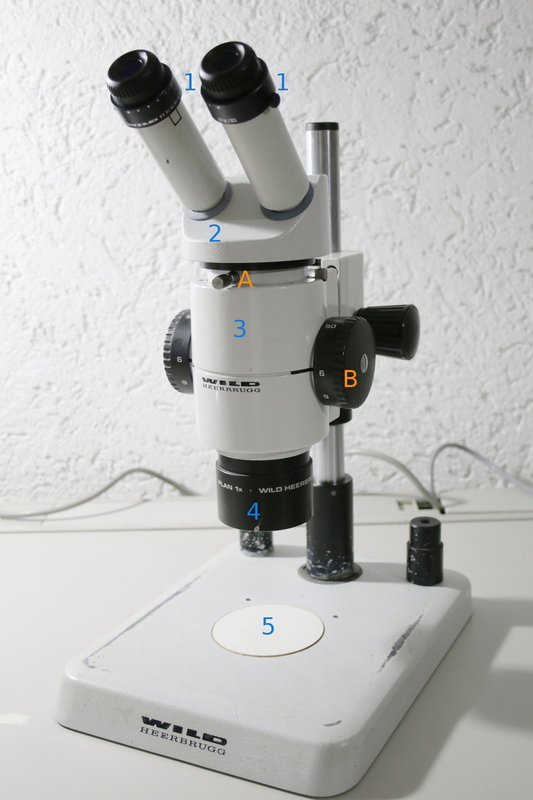 The body can be used with the "default" incident-light stand as pictured here (5), with a boom or swinging-arm stand (ideal for fast visual inspection or soldering) or with a stand for transmitted-light microscopy. 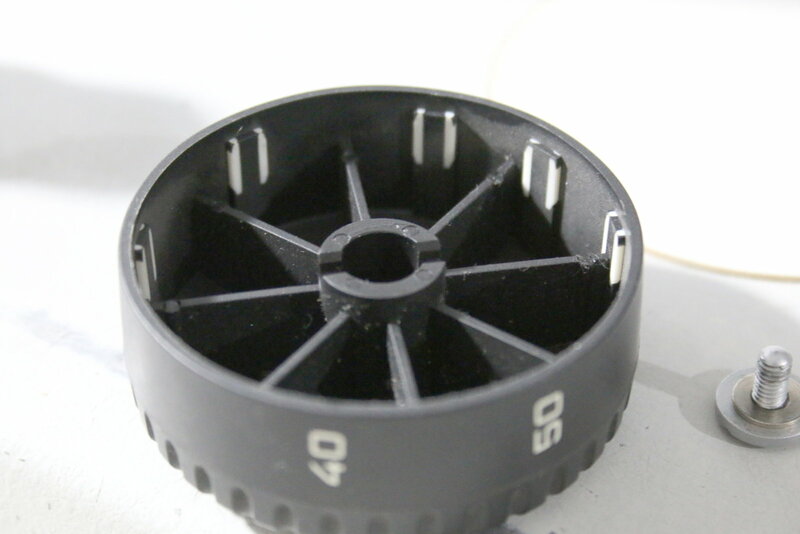 A sign of good quality is that the magnification steps are not simply printed on the hard plastic knobs but they are separately fused in and can´t wear off (comparable to the "double shot molding" in the keycaps of higher-end computer keyboards -> giyf :-). ...to the zoom magic. Four lens pairs and some springs and rails do the trick (apparently the use of plastic was not what the Wild engineers had in mind back then). Sturdy built quality and a lot of ´scope for the money. Seen from below with the objective removed: For those who thought that the M8 was "just another" Greenough microscope - no, it´s of course a high-quality common-main-objective (CMO) one with the two paths of light in parallel (btw: CMO stereo optics are also known as "telescope" or "Galilean" type optics). The huge "Plan" objective (4), which can easily be unscrewed, is quite heavy due to its big lenses. It gathers a lot of light and delivers a bright and crisp image up to around 50 fold magnification (beyond that it gets darker and "empty magnification" becomes an issue). 50 fold is not too much and it shows that the objective is *the* major drawback of the M8 as it is also not a plan-apochromatic one (often referred to as "PlanApo" or even shorter "Plapo"). If used for photodocumentation, it will *always* produce flawed microphotographs with significant chromatic aberrations (especially if higher magnifications are used). 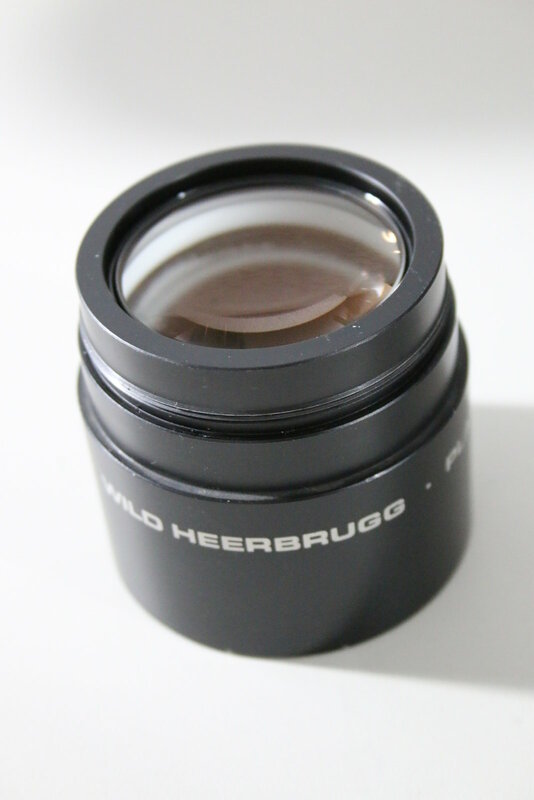 The M8´s successor, the Wild M10 from the late 1980s / early 1990s, features a M8-incompatible PlanApo lens and DIY solutions for the M8 are possible as PierreH could show. 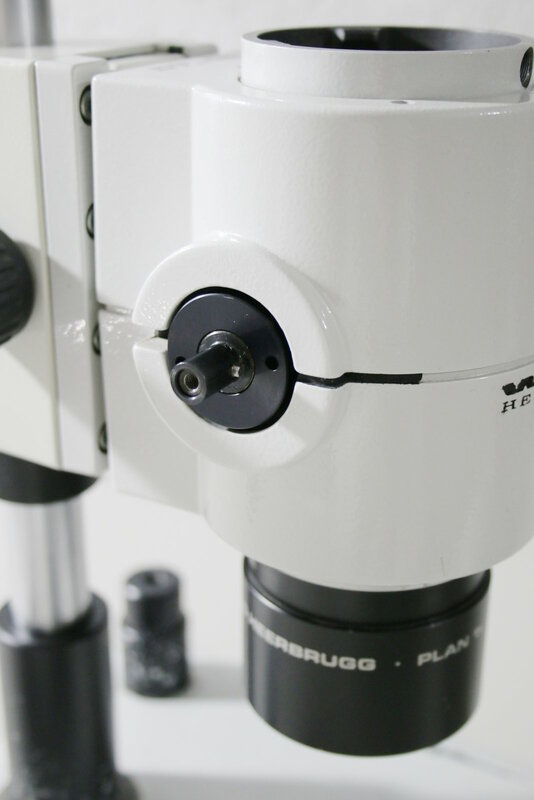 As long as you need it for visual inspection, soldering or preparation purposes, the M8 is still an excellent stereo microscope that can compete well with much newer and more expensive models. 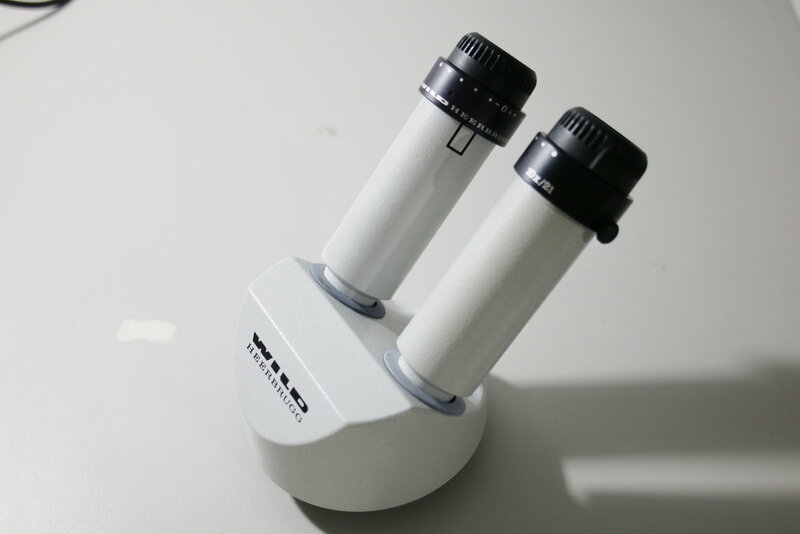 Where it comes to photographic documentation of your work it delivers only average quality and will easily be surpassed by models with PlanApo objectives or a lot cheaper setups that combine microscope objectives with camera bellows. Microphotography on an artistic and more professional level is impossible with the M8.